When it comes to applying makeup, I'm sure you've heard me say on more than one ocassion that I'm all about ease and convenience. I love products that don't require a lot of faffing around - I need to be out of the door by 7:30am every morning so I haven't got time to apply twenty products to my face and quite frankly, I can't be bothered either! That's where multi-use and no brush required products come in exceptionally handy and allow me to have my morning makeup routine done and dusted within ten minutres. With this being said, a product I've been absoloutely loving lately is Benefit Fine One One* thanks to its handy twist and swipe packaging. While I'm talking about the packaging - lets just take a moment to admire this rose gold wonder. 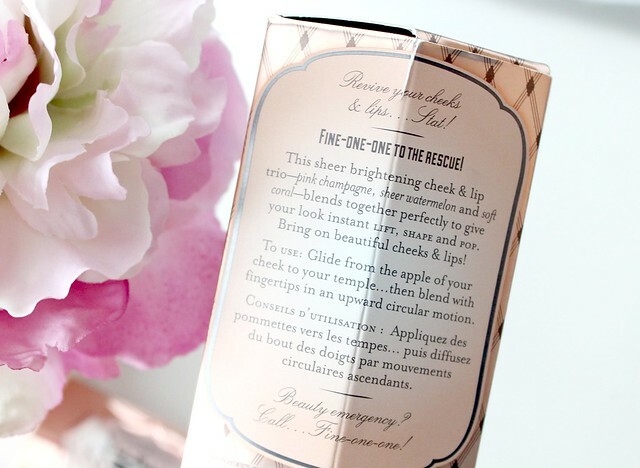 I'm a bit of a rose gold addict so this packaging is right up my street and it looks super pretty sitting in my makeup bag. I also love the little twist up dial on the front - the little touches Benefit add to their products are why I love the brand so much. 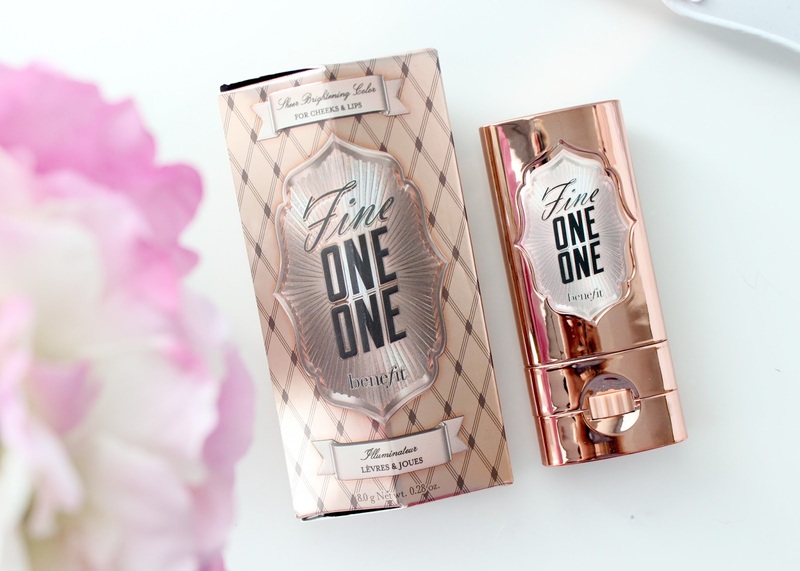 So the idea behind Fine One One is that it contains three different shades - a champagne highlight, a peachy pink and a coral - all of which blend together beautifully to create a pop of multi-dimensional colour to the cheek as well as some radiance thanks to the highlighting component. 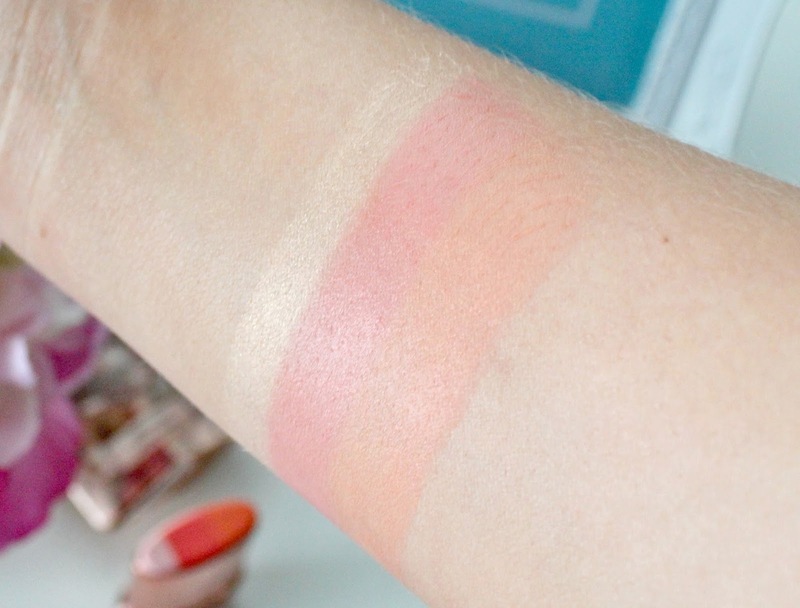 As you can see on my swatch below, the three colours compliment each other perfectly! I apply this product by swiping it from the bottom of my cheekbone (across from the bottom of my nose) and then up towards my ear. Its really hard to go wrong with this product or apply too much as the formula is fairly sheer but that's what I like about it as it allows me to literally swipe and go without having to worry about having clown cheeks. When I've swiped it up my cheekbone (with the champagne shade at the top to highlight), I simply blend the shades together with my fingers and I'm good to go. The formula is very creamy and dewy which I love as it makes my skin look much more radiant and healthy. I also find the shades work well with a tan so I've been particuarly loving this lately to compliment my Portugal tan! The only downsides of this product are the lasting power and the price. 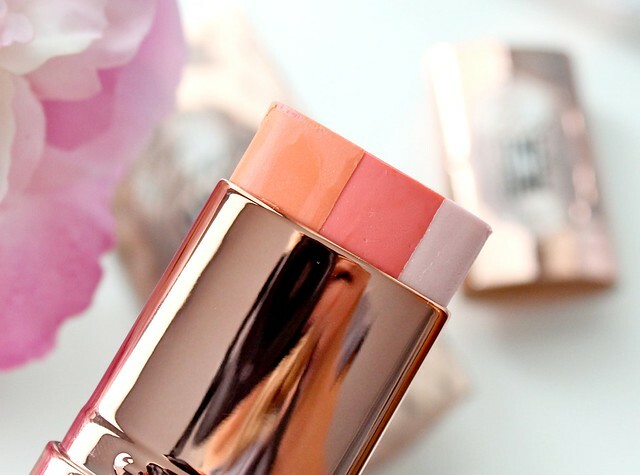 I find it doesn't last more than a couple of hours on my cheeks due to the creamy formula but I can overlook that as its easy enough to pop in my handbag and re-apply throughout the day. The price is the biggest downfall for me as it retails for a whopping £23.50 which seems a little pricey for a sheer cream blush. I know Benefit is a premium brand but I don't think I'd pay over £20 for a product that isn't going to completely transform my makeup. Yes its a beautiful blush but it isn't something I couldn't live without so I personally don't think the price is justified. Do you like the look of this product? It's available to buy here for £23.50. I've heard so much about this product. what keeps me away is that I never thought it had enough pigmentation and it seemed like thee packaging would get very messy. 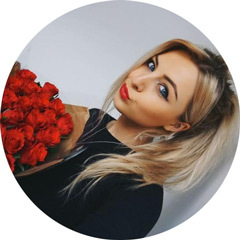 The pigmentation in your photos looks really great though! speaking of, your blog is amazing quality, glad I followed. I was brought this as a gift and while it's a nice product to have I agree it's definitely not essential and I wouldn't buy for myself. What a great review! I'm quite interested now in this product and I'll try it out in the next benefit shop. I have to admit, when I had it applied to me at a benefit advent, I did really like how it looked on my skin tone. However, I do agree with you that the price is a bit steep, especially is it doesn't last very long! I was really excited about this when it came out but never got positive review for it! I am sue it looks beautiful all mixed together! This looks beautiful and like you I am in love with the rose gold packaging. I am not sure on the price though with the lasting power not being amazing. Hmm. Great review. This looks nice, but I have never been too much a fan of cheek stains. Wow, this product is so interesting! The idea is genius, but it's a shame to know that the lasting power is sub-par... What a shame. I've always wanted to try this but keep forgetting to look for it in Boots! It looks really nice! I need this in my life. It's so beautiful!! I am a fan of cream cheek products and getting ready for work quickly so I love this. Would be great to take on holiday with you too 3 in one proudcts ftw! I've always been tempted by the ease of this product but heard similar reviews that it's longevity isn't great. It is really pretty but for the price I would expect it to have great lasting power. That puts me off slightly. This sounds awesome! Just a little too expensive though! I wish I could experiment more with creamy blushes and bronzes but my oily skin doesn't allow me too! shame it does not last very long ! its got beautiful colours but i suppose for the price you would expect so much more staying power!! . I had a sample of this that I really liked but wasn't completely wowed by. I live in South Florida so it's a pretty hot, humid climate most of the time which means makeup really doesn't like to stick around so personally it wasn't worth investing in this. I do have to agree that the color is beautiful. Despite the price I really do want to try this, I think the harmony of colours are very nice together and would look really pretty on. I feel like this is quite complicated - even though it's meant to be simple but using a powder blush would be so much easier, no? I must say, though - the packaging is lovely! This was actually one Benefit product I wasn't so fussed on, but after seeing the swatches I can see the hype. Think a visit to a Benefit counter is needed! I love the look of this! Also, your pictures are absolutely gorgeous! Hey K, the colours look lovely. I'd be worried I'd end up stripy! Do you have to rub it in? No staying power and that price. Ouch!